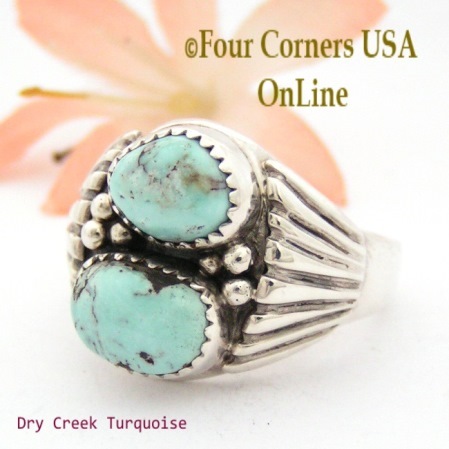 Dry Creek Turquoise Rings available in Sizes 10 through 14. Because smaller size rings are most popular, it is often difficult to find a nice collection of not so common Dry Creek Turquoise in these Rings Sizes. With limited mining and availability, we present one of the largest selections of quality Dry Creek Turquoise stone Rings set in Sterling Silver designed by seasoned Navajo Jewelry Makers including Aaron Toadlena, John Nelson and Tony Garcia. The exquisite paler softer hue of Dry Creek Turquoise is adored for its unique color and natural hardness yet still offering a variety of shades and matrix.